The main use of a boring head is to bore holes. The boring head has some sort of taper to fit the spindle. The body has a horizontal dovetail mechanism. The moving part of the dovetail holds a cutting tool either vertically, as shown below, or almost horizontal. There is some means of moving the dovetail accurately by a small amount. The movement of the cutter is very limited. When the maximum movement has been used up and the diameter of the hole is not big enough it is possible to fit the boring tool in a different hole on the dovetail. When there is not another hole to use it is usually possible to hold the boring bar in a near horizontal position. 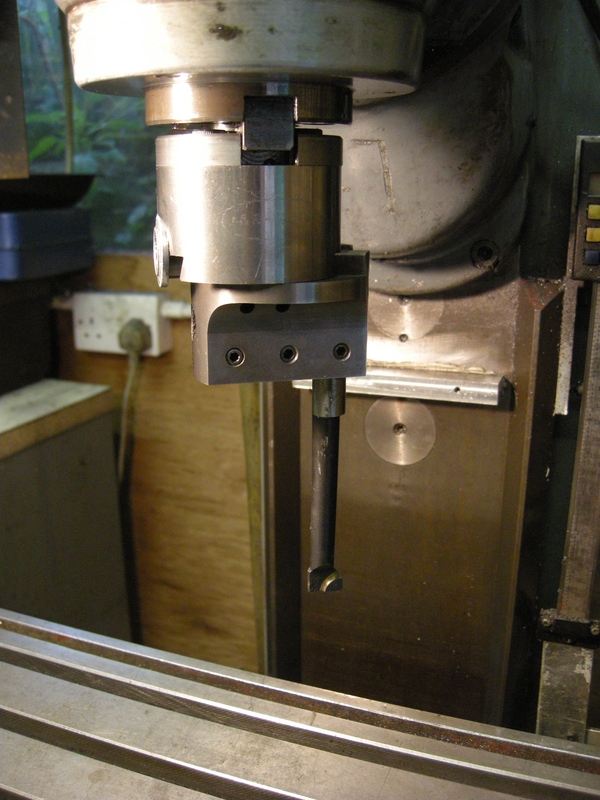 It is possible to use any piece of HSS as a cutter if its diameter fits the holes on the boring head. 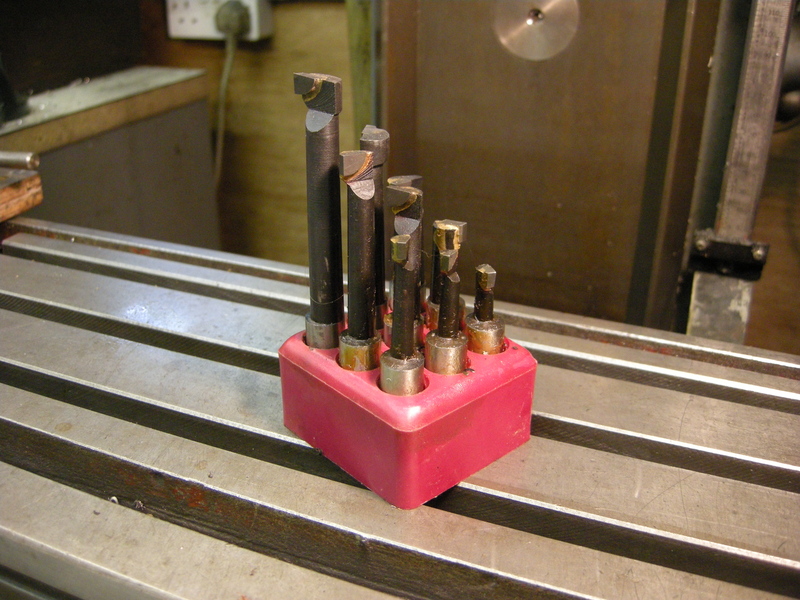 But, in practice, it is easier to buy a set of cutters specially made for the boring head. These are usually made with steel shanks and have a piece of carbide brazed onto the end of the shank. These cutters come in a series of different lengths. This enables the user to pick the best size cutter for any job. In general the shortest, i.e., the most rigid, cutter is required subject to it being long enough to do the job. Such a cutter could be left handed or right handed. They are normally of such a hand that, looking down from above the boring head, the cutter cuts when the boring head rotates in a clockwise direction. This is because the boring head is often used to bore from the inside of the hole towards the outside. If the boring head is cutting from the outside and moving inwards then the cutters have to be the other way round and the head will need to rotate the opposite way. If the cutter is fitted in the horizontal position, the same cutting edge is the wrong way round – the boring head has to be used rotating anticlockwise. Obviously the maximum depth of a hole that can be bored is set by the length of the cutting tool. What is not so obvious is that at the start of the boring operation the cutter will be above the workpiece and the workpiece is probably in height the depth of the hole. This mean the deepest hole that can be cut is only half of the distance from the bottom of the boring head to the milling table at its lowest. 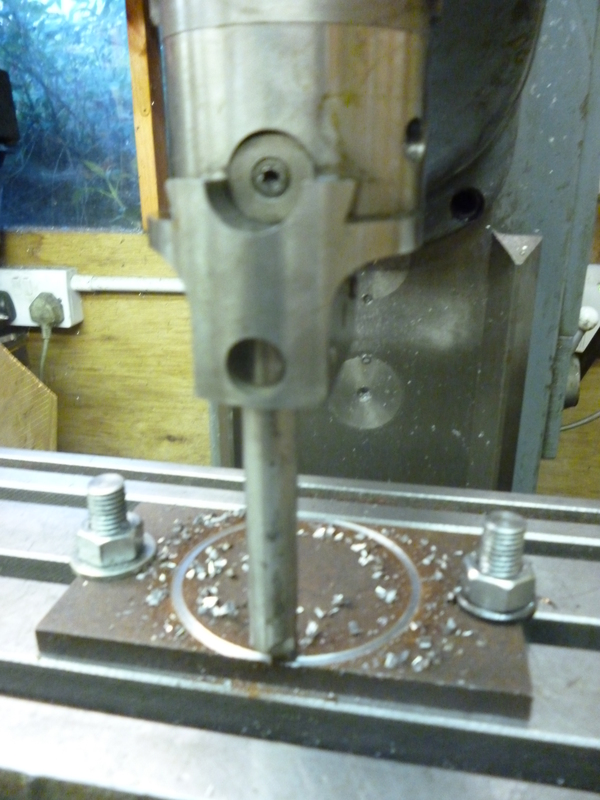 At first sight it might seem that, when boring a hole, the boring head cuts outwards. That is the overall effect but it is achieved by a whole series of downward cuts. For each cut the position of the cutter is fixed. It can only cut by moving downwards. When it has finished cutting in the downwards direction the cutter has to be moved out by the user. This has the unexpected consequence that it cannot usually make a horizontal cut as would be needed to make a groove inside the wall of a cylinder. (It can be used to do this in conjunction with a rotary table). It will be seen that the boring head can hold a cutter in either the vertical position or in a nearly horizontal position. Each has cap screws to hold it in position. It might seem that, sometimes, two screws could be used to hold a cutter in any particular vertical position. But these screws would be on opposite sides of the cutter. In such a situation it is better to hold the cutter with only the screw designed for holding it in the vertical position. If the boring head is set up with the boring bar horizontal as shown above it can be used as a type of fly cutter. The boring head can be used as a trepanning tool. Trepanning is cutting a ring shaped groove in something to remove a round piece of material. The most important point to note it that the shapes of the cutting parts of the boring tools, as described above, are not suitable for this. It would be a mistake to grind away a lot of material of a boring tool in a set to make a suitable cutter. The shape at the cutting edge will be a square end as on a parting tool. 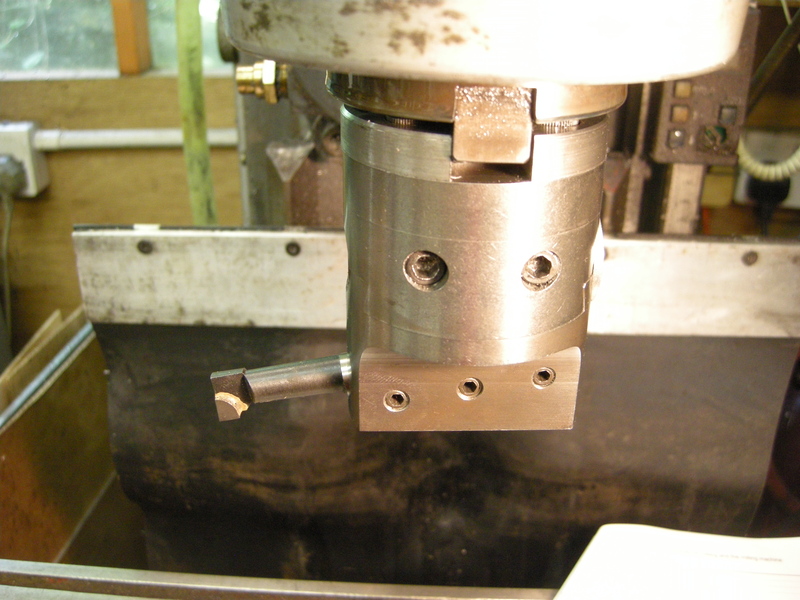 But if it is a small hole the back of the cutting edge has to be such as not to clash with the workpiece. In practice it is very difficult to make deep cuts like this without something going wrong. If the aim is to make a large hole then bore it out. If the aim is to make a solid round shape, unless the sheet is thin, any other method is probably better. A boring head set up as a trepanning tool can be used to cut a groove for holding a rubber o-ring to make a seal. But with the boring head a groove can only be cut by moving the head downwards. It cannot be used to cut a groove in the side of a cylindrical hole except by rotating the workpiece using a rotary table as described elsewhere.